MORPH BUTTERFLY - This beautiful butterfly belongs to the Nymphalidae family, and its prime characteristic are its metallic-blue wings. The white spots in the females wings differentiates them from males. They feed from fallen fruit and inhabit riversides or creeks and trails inside the forest. MORPH BUTTERFLY - The notebook edition. This beautiful butterfly belongs to the Nymphalidae family, and its prime characteristic are its metallic-blue wings. The white spots in the females wings differentiates them from males. They feed from fallen fruit and inhabit riversides or creeks and trails inside the forest. 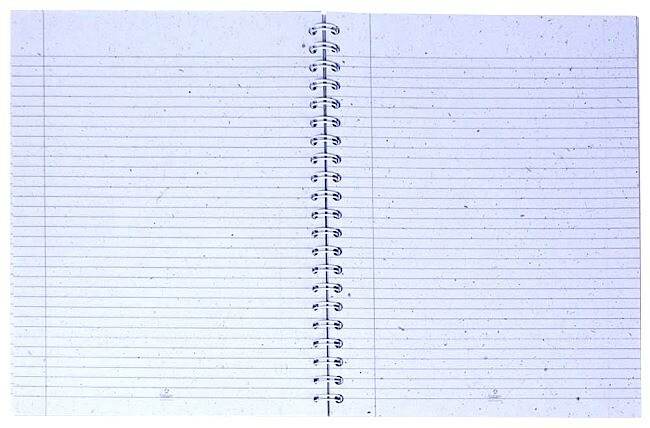 This multi-purpose notebook is made with tree free papers. 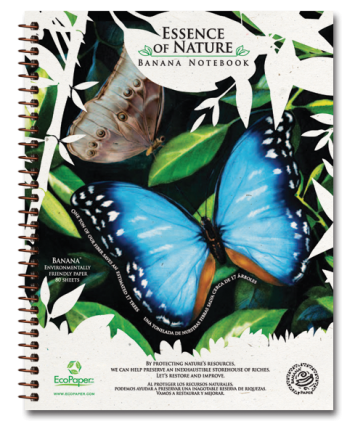 The tree free paper journal includes Ecopapers awesome Banana Paper. The organic notebook is excellent for keeping personal notes, ideas, or for travel purposes. Thoughts, memories, travel experiences or plans for the garden all can be written in your notebook or Journal. Made in Costa Rica from post-consumer waste and plantation agricultural waste fibers. • ECO Paper Details: Tree free Paper, Acid Free Paper (pH Neutral), Better than a recycled or post consumer journal or recycled post consumer notebook. Made with our natural tree free banana papers. LEARN MORE: What is PCF & PCW? Applies to post-consumer recycled content only as it means that no chorine (or compounds) were used "this time around" but there may be traces of chlorine present because of earlier processes which where not our in our own process to make sustainable papers. Waste paper that has served its intended purpose and has been separated from solid waste to be recycled into new paper. This is what you and I take to the recycling center.